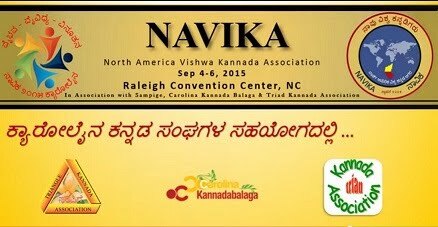 Navika Team is working enthusiastically, to make NAVIKA CAROLINA 2015, a great success. ನಾವಿಕ ೩ನೇ ವಿಶ್ವ ಕನ್ನಡ ಸಮಾವೇಶ ೨೦೧೫ ಸೆಪ್ಟೆಂಬರ್ ೪, ೫ ಮತ್ತು ೬ ರಂದು ರಾಲೆ ನಗರದಲ್ಲಿ ಹಮ್ಮಿಕೊಳ್ಳಲಾಗಿದೆ. Come on... my Triad Kannada Friends, what are you waiting for... Register. It’s once in a life time opportunity to immerse ourselves in our own culture in a foreign land and also expose our kids to the treasury of knowledge that our culture has to offer. Yesterday’s Press Conference with all the Navika team and all the Dignitaries in Bangalore was a great hit. Watch NAVIKA 3rd World Kannada Summit below which was used yesterday in the press conference.